PITTSBURGH—Psychiatric disorders — including autism — are characterized and diagnosed based on a clinical assessment of verbal and physical behavior. However, brain imaging and cognitive neuroscience are poised to provide a powerful advanced new tool. Carnegie Mellon University researchers have created brain-reading techniques to use neural representations of social thoughts to predict autism diagnoses with 97 percent accuracy. This establishes the first biologically based diagnostic tool that measures a person’s thoughts to detect the disorder that affects many children and adults worldwide. Published in PLoS One, the study combined functional magnetic resonance imaging (fMRI) and machine-learning techniques first developed at Carnegie Mellon that use brain activation patterns to scan and decode the contents of a person’s thoughts of objects or emotions. The previous work also demonstrated that specific thoughts and emotions have a very similar neural signature across normal individuals, suggesting that brain disorders may display detectable alterations in thought activation patterns. Now, the research team led by CMU’s Marcel Just has successfully used this approach to identify autism by detecting changes in the way certain concepts are represented in the brains of autistic individuals. They call these alterations “thought-markers” because they indicate abnormalities in the brain representations of certain thoughts that are diagnostic of the disorder. The resulting brain images showed that the control participants’ thoughts of social interaction clearly included activation indicating a representation of the “self,” manifested in the brain’s posterior midline regions. However, the self-related activation was near absent in the autism group. Machine-learning algorithms classified individuals as autistic or non-autistic with 97 percent accuracy based on the fMRI thought-markers. “When asked to think about persuading, hugging or adoring, the neurotypical participants put themselves into the thoughts; they were part of the interaction. For those with autism, the thought was more like considering a dictionary definition or watching a play — without self-involvement,” Just said. “This is a potentially extremely valuable method that could not only complement current psychiatric assessment. It could identify psychiatric disorders not just by their symptoms but by the brain systems that are not functioning properly. It may eventually be possible to screen for psychiatric disorders using quantitative biological measures of thought that would test for a range of illnesses or disorders,” Just said. In addition to Just, the research team included CMU’s Vladimir L. Cherkassky, Augusto Buchweitz, Timothy A. Keller and Tom M. Mitchell. The National Institute of Mental Health funded this research. 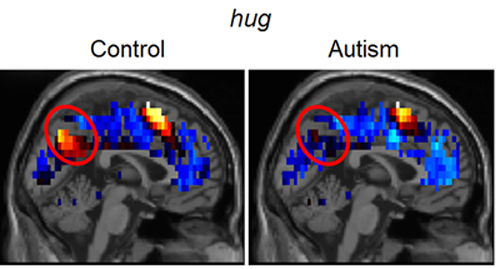 The brain images (pictured) illustrate how the brain representations of a social interaction, “to hug” in this example, differ between neurotypical and autistic participants. The image on the left shows the neural activation for “hug” in the control participants; the image on the right shows the autism group’s near absence of activation in the brain’s posterior midline region – an area which contributes to the representation of the “self.” Although these images show the group average activation patterns, the brain representations of the social interactions in individual participants were sufficiently distinctive to allow participants to be identified as belonging to the autism or control group with 97% accuracy.